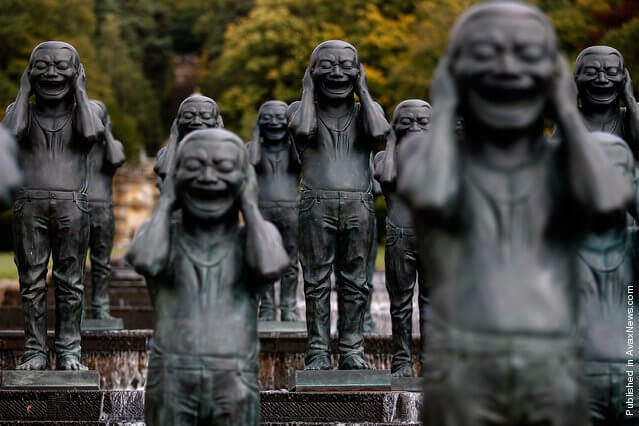 Yue Minjun is one of the finest, and most recognizable, contemporary artists in China. He paints in oil, watercolor and is also a fine sculptor and printmaker. Yue Minjun was born in 1962 in Daqing, a town in China’s northeastern Heilongjiang province. He grew up during the Great Proletarian Cultural Revolution, which began in 1966.-1976. The Revolution was a repressive time in China, when the government sent intellectuals to the countryside, to learn about agriculture and production, so they could contribute to the revolution through physical labor. The Revolution ended in 1976, with the death of Mao, and social and cultural changes began to take hold. Minjun’s father worked in oil fields. 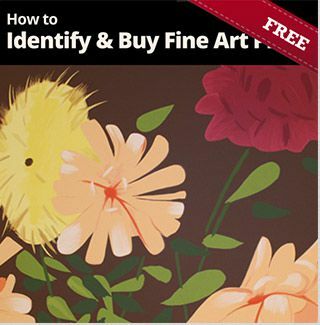 Although he always painted as a hobby, Minjun also worked in the fields. After graduating from high school, in 1980, Minjun studied to be an electrician. He worked at deep-sea oil drilling and continued to paint, often creating portraits of his co-workers. In 1983, Minjun studied painting at Hubei Normal University, in central China. 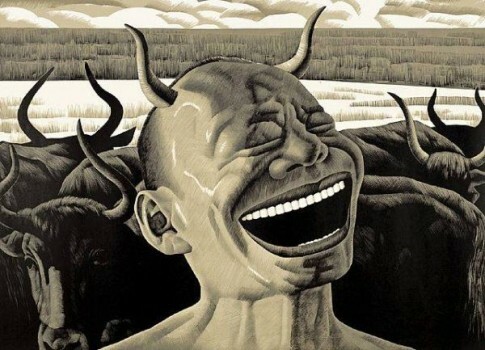 In 1989, Minjun went to an exhibit in Beijing, where he saw a painting by contemporary artist, Geng Jianyi, depicting Jianyi’s laughing face. The student and intellectual protests in Tiananmen Square in 1989 prompted Minjun moved to Hongmiao, in Beijing’s Chaoyang district, which had become home to many young Chinese artists. 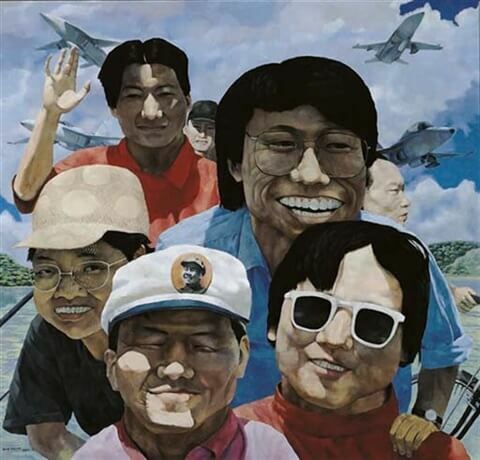 The protests created an art movement called Cynical Realism, in which many young artists began to present a realistic picture of the difficult political and social changes taking place in China during the 1980s and ’90s. International recognition came to Minjun in 1999, at the 48th Venice Biennial, where a series of his sculptures, representing the Terracotta Army of Qin Shihuang, the First Emperor of a United China, was displayed. 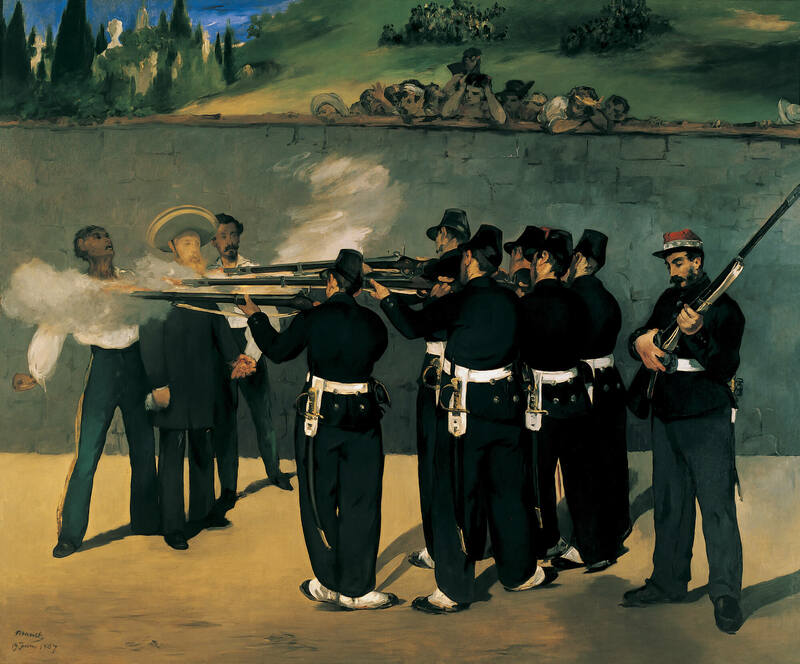 Minjun often references Western painters, as in The Execution after Edouard Manet’s Execution of Maximilian. Minjun’s Execution painting sold for a record $5.9 million at Sotheby’s London in 2007 and his works continue to attract high prices from collectors. Minjun had his first U.S. show at the Queens Museum of Art in 2008 and continues to exhibit at major venues around the world. His work can be found in permanent collections in China, Korea and Singapore, as well as collections in Europe and America. 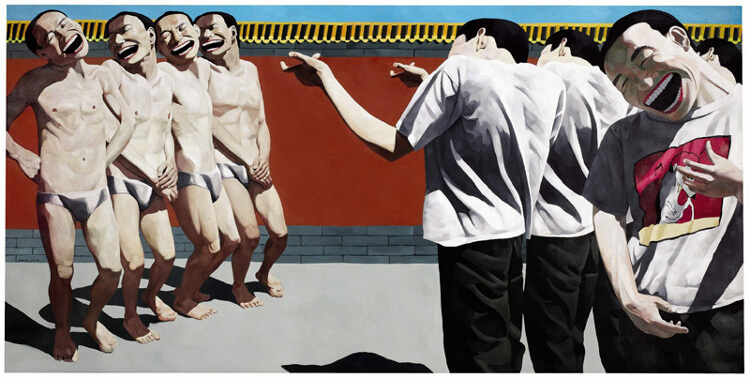 Yue Minjun continues to live, and work, in Beijing. Y-Jean Mun-DelsalleBehind Internationally-Renowned Chinese Artist Yue Minjun’s Hysterical Laughter Forbes November 7, 2014. Hugo Hess Yue Minjun WIDEWALLS August 5, 2016. Elena Cué Interview With Yue Minjun Huffington Post December 06,2017. 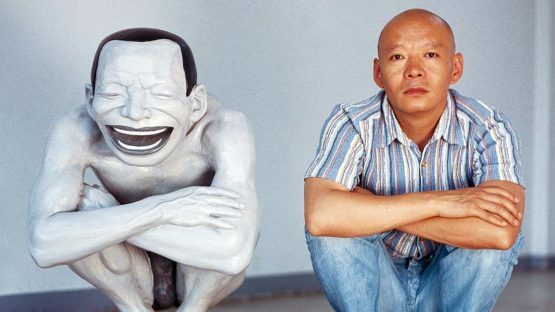 Yue Minjun sitting with his sculpture.